Based on requests we are offering a second session with a smaller class size. Experience the life of a sports photographer! 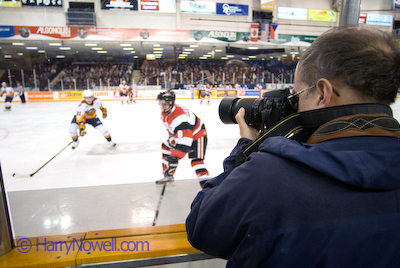 Our 'Pro Hockey Photography Workshop' brings you face to camera with the next NHL hockey superstars at an Ottawa 67s home game! We help you shoot better hockey photos, period. See Scott Kelby's hilarious account of his "painful dance with shooting hockey!" home game! We help you shoot better hockey photos, period. 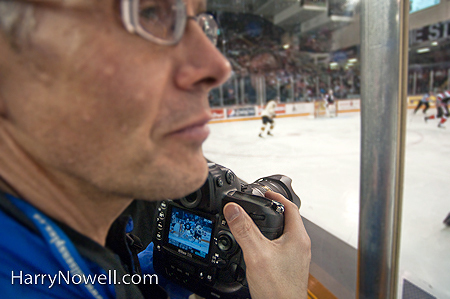 Get close to the action with Photographing Pro Hockey. J Benson Cartage Centre at Lansdowne Park. Live the life of a sports photographer! This workshop is aimed at intermediate or advanced photographers. You will learn first hand the challenges and fun of shooting future NHL stars with the Ottawa 67s and the London Kights as they sprint for the puck metres from your camera! 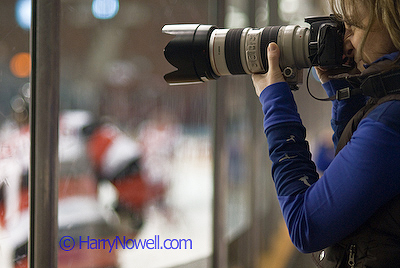 Photograph a fast-paced, elite hockey game from ice level with media photographers. Learn new skills while working under the pressure of a big event. Learn to read the plays to catch the action. choosing appropriate equipment for fast paced action! Enjoy the chance of accessing pro tips. Build your portfolio and impress your friends. 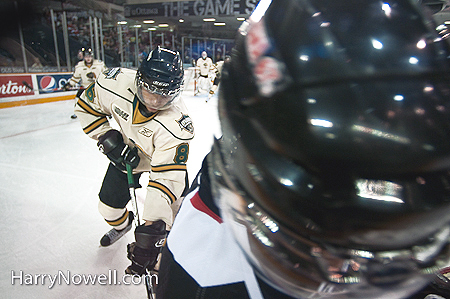 Past student Valerie Wutti opened doors after her Pro Hockey Photo course in 2008. She developed contacts with the 67s and now receives a 67s media pass to support her official Ottawa 67s Fan Blog. She has also published two books on the Ottawa 67s. "Is this a digital or film course?" It is a photography course - about creating better photos. The emphasis is on your skills behind the camera and your ability to effectively use the camera you have. Most participants bring digital cameras. Some choose film. Some bring both! Having people with both technologies on a course helps to compare the differences. Do not worry about your equipment - all you need is a 35mm SLR camera and lens(es) - no "point and shoot" cameras please. Course Instructor: Harry Nowell is a photographer providing editorial, commercial and stock photography to clientsfor almost 20 years. Bring your equipment to learn how to make it perform! Participant Requirements: Students are required to bring a 35 mm SLR digital or film camera with a manual setting option - no point and shoot, please. Also, students should bring lens(es) that offer some wide angle (< 50 mm) and telephoto (>70 mm) capability. Zoom lenses are fine. A tripod, cable release, and slide film (if needed) round out your camera bag. Register by email or by phone at 819-827-9460. Space is limited. This course is popular. To reserve your spot a deposit of $125 is required and a complete registration form.